Has your school had The Lazy Mondays experience? Now in their 14th successful year this is a real live band experience in your school hall! 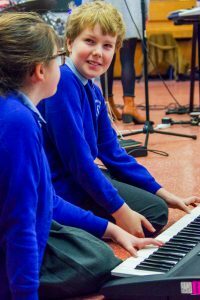 Our in-house Lancashire Music Service pop band, The Lazy Mondays, have a small number of sessions available for booking before the summer holiday. 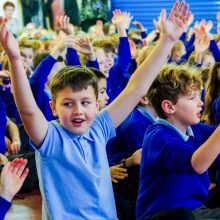 Full school performances of pop music from across the decades (new songs for 2018) and music workshops for up to 70 children on a wide variety of cross-curricular topics. Lots of participation guaranteed for pupils and staff! Experience the sound of live guitar, bass, drums, keyboards and vocals in your own school hall. Aimed at KS1 and KS2. For just £175 for a one hour show or £250 for a full morning workshop including performance. Or visit www.lancashiremusichub.co.uk for further information. Bookings are already being taken for 2018/19. For more information on Lazy Mondays click here.